Hello to all my FGM e-lesson readers. I’d like to thank all those who take the time to email me your thoughts and positive feedback. I enjoy hearing what you have to say and the more that you write in, the more interactive I feel with the lessons. 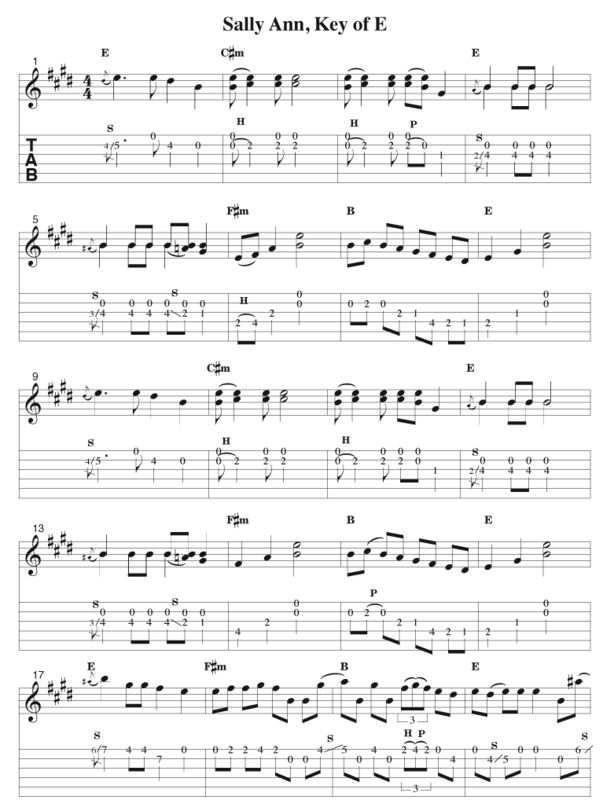 I come to you this month with a classic fiddle tune arranged for flatpicking guitar. When selecting tunes for FGM’s e-newsletter a have to take into account a lot of things. First, I must realize that there is a varied skill level that exists amongst the readers. Next, I find that different flatpicking guitarists are often drawn towards liking different types of tunes, arrangements, or styles of flatpicking. Sometimes I’m not sure what arrangements of what tunes will satisfy all the eager flatpicking students out there. In fact, the flatpicking genre seems to be getting more popular and more diverse all the time. For this reason, I have offered two versions of the same tune this month. Not just the typical easy/advanced two versions—but rather one in a traditional flatpicking key of G and the next in open E, a rather unorthodox flatpicking position. “Sally Ann” is a melody that I have heard a lot going to music festivals around Florida and throughout the country, but it seems it’s always done on fiddle or banjo…or even sung. For some reason, it has never made it into the world of flatpicking. Together we can change this! 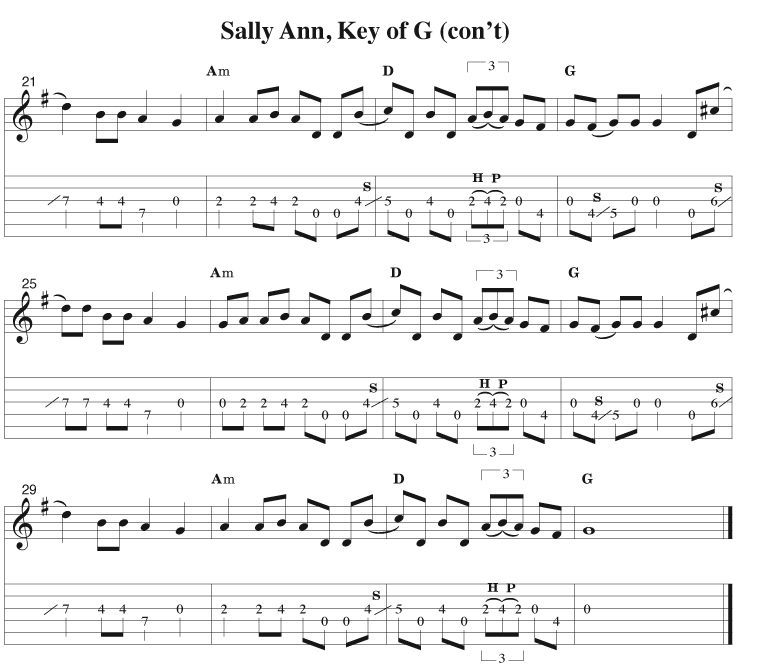 Learn the tune, pass it on, and we will slowly make “Sally Ann” the new “Sally Goodin”! I suggest going through my G version first. This arrangement will feel familiar as it will relate the melody to other fiddle tunes you already know in G position. Once you get it under your fingers you’ll want to pick this tune with your banjo buddy who has no doubt learned Earl Scrugg’s break! If the double-stop slides seem too advanced for you, just leave off the higher of the two notes—this will express the melody of the tune just fine. When you are practicing, keep trying to get the double-stop hammer-ons, but don’t let this stop you from jamming the tune right away. 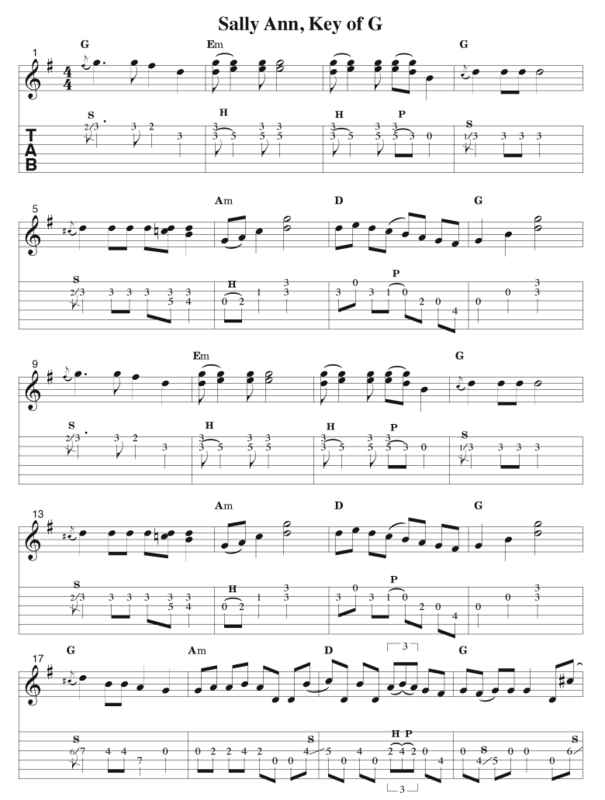 I enjoy playing this song in G, but I often enjoy experimenting around with other keys to flatpick in. Sometimes by doing this you may uncover a new way of interpreting an old song. 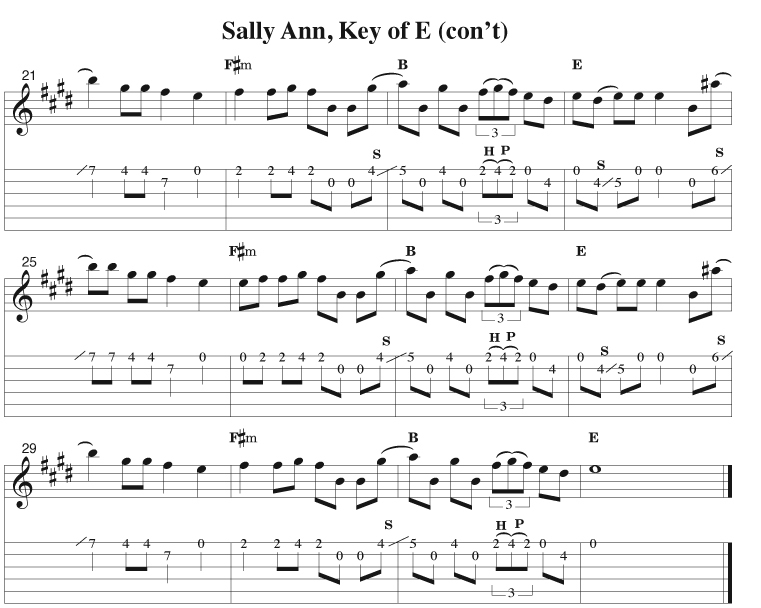 My open E version of “Sally Ann” will drive your banjo buddies nuts trying to play back up, but it may give you some new ideas to explore when practicing your guitar alone. The key of E on the guitar utilizes great open strings and also includes some great chordal possibilities. The classic G to Em (I-VI) change becomes E to C#m (I-VI). Likewise the time tested G to Am (I-II) change becomes E to F#m (I-II). To me, chords like C#m and F#m have a special timbre and tonal quality on the guitar. Try playing “Sally Ann” in E and see (I mean hear) if your ear enjoys the tones your guitar produces when flatpicking in E.
I hope you enjoy playing “Sally Ann” in G and exploring it in E. If you have any questions, comments, or suggestions for future e-lesson tunes drop me a line at michabraham@comcast.net.